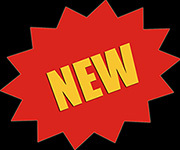 CAL/OSHA mandates that when an employer provides a portable fire extinguisher for the employees to use, the employer must also provide a training class to familiarize employees with the general principles of how to use a fire extinguisher, and the hazards involved with incipient stage firefighting. Training must be given upon initial employment and at least annually thereafter. CAL/OSHA however, doesn’t lay out many specifics about what a fire safety training program should include. 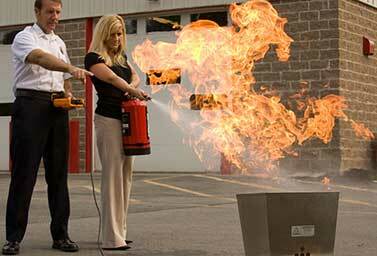 At Workforce Safety Training, we have found that BullEx Fire Extinguishers to be by far, the best. To ensure your employees are prepared to deal with emergencies in the workplace, we use the state-of-the-art BullEx Fire Extinguisher Training System, designed to help you educate employees and comply with state and federal safety regulations. Trainees will leave the BullEx fire extinguisher training program with knowledge of the sources of fire, classes of fire and their corresponding fire extinguishers, how to identify an extinguisher, how to assess a fire situation, and fire emergency protocols. BullEx’s clean fire extinguisher training classes in San Bernardino, Riverside, and Inland Empire. Prepare your employees with BullEx’s realistic, clean, and cost-effective training solution. Workforce Safety Training is located in Murietta, Ca and serves: San Bernardino County, Riverside County, and the Inland Empire. 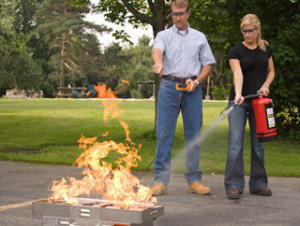 Indoor or outdoor hands-on experience with a fire extinguisher. Call us today to schedule a class: 951-219-5203 OR 1-888-241-9513. To request more information or to schedule a consultation, fill out our form. Click the image below to watch us in action! Copyright © 2009-2015 WorkForce Safety LLC, All Rights Reserved.